Could the State of Oregon's Response to Beached Whales Be Improved? by Range Bayer of Bayer Research. To email comments. Last Update: 25 August 2009. Links Last Checked: 24 August 2009. First on Internet: 12 June 2007. 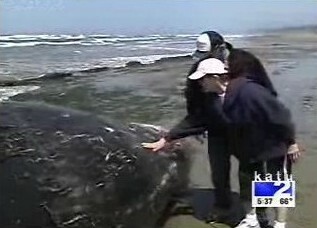 Image from May 28 KATU-TV news video of people touching the beached whale. The video also showed a man cutting off a piece of whale skin. The May 28 KGW-TV news video also showed people touching the whale. The May 28 KATU-TV news video or May 28 KGW-TV news video did not show State staff, volunteers, or signs warning people to not touch the whale because of health concerns or that removing whale parts was illegal. These warnings were also not included as part of these news videos. During my May 28 visit, I also did not see any State staff, volunteers, or signs giving warnings. The May 28 KATU-TV news video indicated that ever since the whale had beached on May 27 that it had become a "hands-on exhibit." On May 28, the whale had not deteriorated to the point that curious people were deterred from touching it. The State's warnings about health and not removing whale parts began to be publicized on May 29, two days after the whale beached and after the Memorial Day weekend was over. Below is my letter to Governor Ted Kulongoski that has been re-formatted for the Internet. Information about the gray whale that beached north of Seal Rocks is also given in links in the Footnotes. Contact Governor Ted Kulongoski about this or other issues at http://governor.oregon.gov/Gov/contact_us.shtml. Re: gray whale that beached near Seal Rocks on Sunday, May 27, 2007. There are significant health, legal, and financial concerns about the State of Oregon's response to this whale. In November 1970, the State of Oregon used dynamite to blow up a beached whale near Florence. The failure of this attempt has become a legend popularized by columnist Dave Barry. Additionally, videos, pictures, and the story of this event are widely available at http://www.theexplodingwhale.com/, KATU-TV's "The Infamous Tale of an Exploding Whale," KOMO-TV's "Have You Heard the Tale of the Exploding Whale? ", and http://en.wikipedia.org/wiki/Exploding_whale. The KATU-TV and theexplodingwhale.com web sites were included in some news media reports of the May 27 beached whale, so those who had not heard about it could learn about this legend. The State of Oregon's handling of the May 27 beached whale suggests that the State does not appear to have learned from the "Exploding Whale" incident the importance of having a prudent, coordinated policy for protecting public health, educating the public, determining the cause of death, reducing the risk of illegal theft, and the proper disposal of a beached whale. The May 27 whale incident also reveals that it is not even clear which State of Oregon entity is responsible and accountable. The Oregon Parks and Recreation Department (henceforth termed State Parks) was reported to be responsible in some news stories. But Morris Grover of the State Parks' Whale Watch Center also said that State Police "normally" patrol beached whales (Footnote 1). After parts of this whale were illegally removed, the State Police's May 29 news release stated that they were investigating the theft (2). Further, the Oregon Marine Mammal Stranding Network was involved in taking measurements and some samples of the whale to determine a cause of death (3). The Stranding Network's May 29 press release indicates that partners in this Network include "OSU, Portland State University, the University of Oregon's Institute for Marine Biology, the Oregon Department of Fish and Wildlife, the Oregon State Police, the Oregon Department of Parks and Recreation and others" (3). The beaching of the whale was well publicized the day of the beaching, Sunday, May 27, as well as the following day, Memorial Day (e.g., 4, 5, 6, 7). The story was reported not only by Oregon newspapers and television stations but also by the Associated Press, United Press International, Northwest Cable News Network, and KOMO-TV in Seattle. Accordingly, many people knew about it during the first two days. It was very predictable that many people would be attracted to and visit the whale, especially since it was so accessible near Highway 101 during a holiday weekend with good weather. The KATU-TV news video the night of May 28 reported that it drew "huge crowds" and was "likely the single biggest attraction on the Oregon coast this holiday weekend" (6). On March 29, Morris Grover of State Parks' Whale Watching Center was reported as saying that there were about 50 people there when he visited and "I would say hundreds of people have visited it since it arrived" (1). This was a big event, and, for many people, it may have been the only time in their lives that they would be so near a whale or have the possibility of touching one (e.g., see video in 5 and 6). Even for long-time coastal residents such as me, this was a fascinating event worth a special trip to see. State Parks acknowledges and encourages the exceptional interest of people in whales by having a Whale Watching Center in Depoe Bay. The day the whale was beached, May 27, the Oregon Marine Mammal Stranding Network took some tissue samples (video in 5). The Stranding Network's press release indicated that it might not be possible to determine the cause of death because of decomposition and the "limited amounts of organ samples that could be taken" (3). Doing necropsies as soon as possible is important because organs and tissues can deteriorate, so determining the cause of death may not be possible later. Perhaps the most common question people have asked is "why did this whale die?" This was a focus of concern in May 27-28 news reports and news videos (e.g., 5, 6, 7). On May 30, the Associated Press' story "Cause of Death for Whale Undetermined" was picked up by at least 42 newspapers, radio networks, or other news services across the United States, including the New York Times, Washington Post, Boston Globe, Forbes, CBS News, Fox News, and Yahoo! News (8). The title expresses the concern about why the whale died, and this story's widespread coverage suggests that the failure to determine the cause was very newsworthy. Determining the cause of death for the whale is important not to just a few research scientists but also to the public. Doing a full necropsy may determine a cause of death, but it seems that this was not done for this beached whale (3). While a necropsy can expose guts and look unseemly, many people are familiar with autopsies or surgeries exposing guts through TV shows or movies, so they are not shocked, but are interested in the process and especially in the results. I visited the whale the afternoon of May 28, about a day and a half after the whale was beached. I saw that people noticed some of the guts hanging out--and nobody touched them because they were wise enough not to do so. I also noted that there were no State Parks or State Police staff or volunteers around. Further, there were no signs to warn people not to touch the whale or to inform people or the news media that removing whale parts was illegal. Many people were excited about seeing and touching the whale or having their picture taken with the whale. The May 28 KATU-TV news video caught the excitement of people touching the whale's skin or baleen and noted that it was a "hands-on exhibit," but did not provide any warnings, though their web page did (6). [The May 28 KATU-TV video also showed a man cutting off a part of the whale's skin (6). The May 28 KGW-TV news video also showed people touching the whale, and no warnings were included in the video to not touch the wahel or to not remove whale parts (13).] The afternoon of May 28 was windy, so the smell was only noticeable downwind. The whale had not yet deteriorated to the point that it seemed too gross to touch. It was Memorial Day weekend, so State Parks and State Police staff may not have had time to be at the whale, but both also have volunteers. Additionally, the State Parks' Whale Watch Center coordinates Whale Watch Weeks and volunteers--why didn't State Parks contact Whale Watch volunteers to be at the whale to provide education about the whale? This was an excellent opportunity for informing and educating the public and news media about whales. Why didn't State Parks or State Police at least put up a warning sign near the whale about health concerns or the illegality of removing parts of it? On May 29, two days after the whale beached, it was reported, "authorities finally posted signs telling people to keep away" (1). But did the sign(s) remain until the whale was moved? Temporary signs could have been made quickly, placed in plastic for endurance, and put on temporary posts. It was windy, but a sign could have been made and posted so that it would endure the winds. A sign could have been put up after and removed before high tides, if the sign could have washed away. A temporary signboard with information about this whale (e.g., it was a gray whale, its length and weight, gender, and age) could also have easily been posted. The warning sign on June 1 after the whale was buried and was exposed by tides was inadequate because it did not establish which State entity was responsible nor that there were health risks to touching a whale nor that removing whale parts was illegal (see Figure 1 below). The first public warning to not touch or remove whale parts may have been the night of May 28 on KATU-TV's web page (6). But their video that evening shows people touching the whale or removing parts of the skin and did not give health warnings or inform people that removing parts was illegal (6). On May 29, two days after the whale beached, press releases and the news media began warning people to not touch the whale because of health risks from possible diseases and warnings to not remove whale parts because it was illegal (e.g., 1, 2, 3, 9, 10, 11). These warnings continued on May 30 (12, 13, 14). In a May 29 account, Morris Grover of the State Park's Whale Watch Center expressed concern that the necropsy to get tissue samples had increased the health risk (1). If so, why didn't State Parks or State Police respond to the health risk with staff, volunteers, or signs? Is the State liable for failing to provide health warnings for this whale after it was beached and attracting crowds of people? The May 29 Oregon State Police News Release indicates that the Marine Mammal Stranding Network had started to provide "employees and volunteers at the whale site to educate and inform local residents and tourists about the whale" (2). This was late. By the time of the May 29 warnings, parts of the whale (especially part of its baleen) had also been removed. The afternoon of May 28, I noticed that the front part of the baleen (including the gumline base to which baleen plates were attached) in the whale's right jaw had been expertly cut out very smoothly. Between then (also see May 28 video in 6) and the photo in the Oregon State Police's News Release the next day (2), additional individual baleen plates had been roughly and partially hacked or pulled out, probably by hand or with hand tools. The State's lack of responding with staff, volunteers, or signs has also resulted in issues about illegal possession of whale parts. State Parks had an inadequate disposal plan for the whale. The whale was beached on rock, so it could not be buried there. In my experience at that beach, sand often comes and goes, and sand had been scoured from that beach area in recent months. So I was surprised that State Parks had contractors bury the whale only about 100 yards away on Thursday, May 31 (15, 16, ). It was predictable that the whale would be uncovered because State Parks chose a poor site. Indeed, the very next day, June 1, about a third of the whale was exposed as reported by the Oregonian (17). Then State Parks decided to bury the whale deeper and above the high tide (17), which should have been the plan before they first buried it. It seems that State Parks wasted money by burying the whale at such a poor location because it would cost extra money to bring out the equipment again, remove the whale from where it was first buried, and then bury it at a more appropriate location. Hopefully, the whale will remain buried at the second site. The State's response to this whale is questionable. Could the State of Oregon improve its policies to better deal with future beached whales and their disposal? The State could much better inform and educate the public and news media. It also appears that the State could have a more coordinated response by State Parks, State Police, the Oregon Marine Mammal Stranding Network, and any other State entities that are involved with beached whales. Jim Rice, Coordinator of Oregon Marine Mammal Stranding Network. Figure 1. 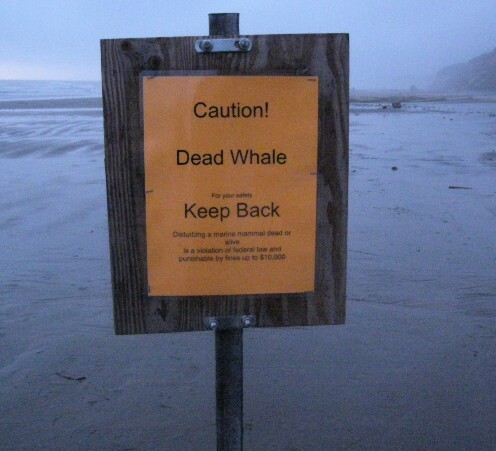 Sign near buried, beached whale on June 1, 2007. The whale was first buried on May 31 (15, 16, ), but tides exposed it on June 1 (17). This sign could easily have been made more informative. There is no contact information or other information about who is responsible for the sign (or the whale), so no agency takes responsibility for this sign (or, apparently, the whale). A temporary warning sign could have also mentioned health concerns about touching a whale. It could also have stated that removing whale parts is illegal. People may be unclear what "disturbing" a dead whale means. It would be helpful if warnings were also given in Spanish. 1. BeachConnection.net. 2007. Touching Dead Oregon Coast Whale Could Mean Fines, Disease. May 29, Beach Connection.net. Whale photos courtesy of Morris Grover, Oregon State Parks' Whale Watch Center. 2. Oregon State Police. 2007. Investigating Into Removal of Parts From Dead Whale Near Newport. May 29 News Release. 3. OSU News and Communication Services. 2007. Study of Dead Whale May Be Inconclusive, Scientists Say. May 29 Media Release. 4. Bradshaw, Nick. 2007. 40-foot Whale Washes Up on Oregon Coast. 5:50 PM on May 27, KGW-TV (Portland). This was also on Northwest Cable News Network at http://www.nwcn.com/topstories/stories/NW_052707ORNbeachedwhaleSW.16c16292.html on May 27. 7. United Press International. 2007. Whale's Death Stumps Oregon Authorities. May 28, Science Daily. Associated Press. 2007. Cause of Death for Whale Undetermined. May 30, Boston.com news, "Your Connection to the Boston Globe." 9. KATU Web Staff and Associated Press. 2007. Police: Stop Taking Parts of Dead Whale. 5:56 PM on May 29, KATU-TV (Portland). 10. Associated Press. 2007. Officials on Oregon Coast Tell Tourists: Hands Off the Dead Whale. 4:25 PM on May 29, KTVZ-21 (Bend, Oregon). 11. Anonymous. 2007. Stealing Whale Parts Is A Crime. May 29, KOIN-TV (Portland). 14. Price, Niki. 2007. Beached Whale Draws Crowds. May 30, Oregon Coast Today. This is a cursory search for reports, there may have been others. NOAA's Marine Mammal Strandings in Oregon & Washington 1999-2004 at NOAA's Marine Mammal Stranding Information web page and the report above for Washington indicate. While most [gray] whale deaths occur in the ocean, the 50 carcasses found on Washington state shores alone in 1999-2000 may have marked a converging of two extremes, Calambokidis said: The whale population reaching its maximum carrying capacity and a natural downturn in the cyclical availability of food and prey. Many researchers believe both the high population number and the big die-off were "blips," Calambokidis said. Thus, it is predictable that there will be more beached gray whales and other marine mammals, so a coordinated plan for dealing with them is appropriate. For more information about beached whales, Google "beached whale" or see " Wikipedia's Beached Whale, select tursiops.org's Cetacean Deaths, tursiops.org's Stranding News, and http://www.theexplodingwhale.com.